Sea Lodge Condominiums are located in beautiful Princeville on the Garden Isle of Kauai. Sea Lodge 'A2' is a private end corner unit situated high on a tropical garden bluff with exceptional ocean and reef vistas where you can easily watch whales frolicking, seabirds flying by, and turtles feeding on the reef below. Relax in your private Jacuzzi while enjoying the white water view then drift off to sleep to the sound of the ocean and coconut palms swaying in the breeze. Our condo is a romantic 1 bedroom suite perfect for a secluded get-away, a truly romantic Honeymoon, or Anniversary. The condo comes with a fully-equipped kitchen [ remodeled 2007 ], custom Jacuzzi bath with a separate shower, a cozy living room area where you can read your favorite novel or gaze at the ocean while resting on the window bench seat. There's also the lanai for outdoor lounging. We live in Southern California and love to travel. We acquired our property after many family trips to the Hawaiian Islands. We had been visiting the Hawaiian Islands since 1982. Kauai's north shore is one of the most beautiful places on this planet. The location of our condo on the bluffs of the Princeville Resort overlooking the Pacific Ocean and Anini reef just couldn't be any better. Sea Lodge #A2 is a corner unit away from the rest of the properties at Sea Lodge and is very quiet, peaceful and relaxing. A small piece of paradise! Unobstructed Views of the Pacific Ocean and the reef below. Updated and renovated kitchen and bathroom. Jacuzzi tub and walk-in shower. Trails to the secluded beach directly behind the condo. Whale watching, Birds - Shearwaters - Nene's to name a few. Very close to all of the North Shore sights and amenities. Walk-in Shower with a separate Jacuzzi Tub. Located on the north shore of Kauai in the Princeville Resort. Sea Lodge Beach is located at the bottom of the trail that is located behind the condo. It's about a 10-15 walk down to a secluded cove with good snorkeling and sunbathing. Unobstructed views from every window of the Pacific Ocean and Anini Reef. 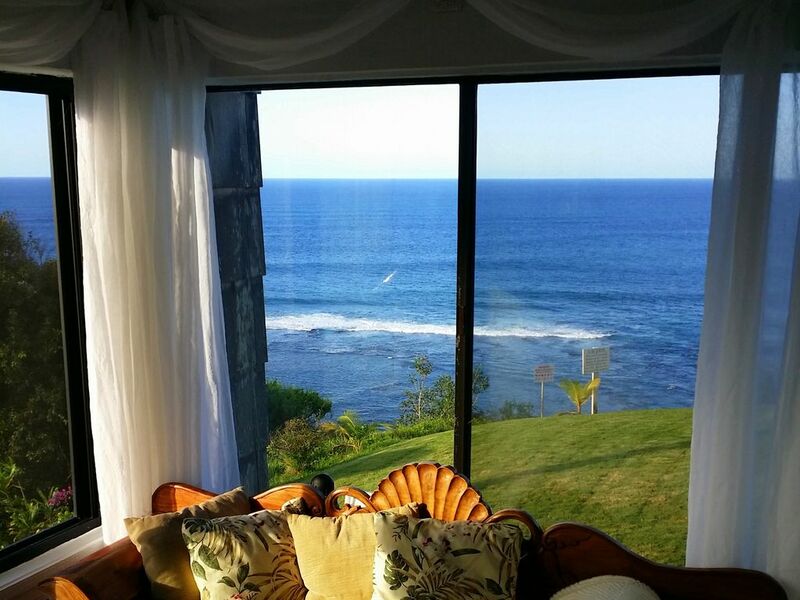 Unobstructed beautiful white water views of the reef from every window. The coin operated Laundry Room is located outside our unit. GE Speedcook Oven with 3 Options - Speed Cooking. Baking and Microwave. Everything is included, cookware, dinner ware, glasses . . . .even the kitchen sink. Located within the Princeville Resort. There are no Wheelchair Ramps at the entry door. Located in the middle of the Sea Lodge complex. A gate code to enter the pool area is required. The location was super. As we were driving in we were getting more excited as we were getting closer to the ocean. We parked in the last parking lot, closest to the ocean. Great sunsets, super sound effects 24-7.
ideally located in a "no-frills" condominium complex. the unit is in better shape than the overall complex, which is feeling the effects of decades of maintenance deferred. this studio offers excellent breezes, unobstructed views, and is more private than most. it does, however, have its quirks: there is no bathroom door (just a pair of cafe doors), an awkward (and awkwardly situated) dining table (glass top, enormous stone bottom, exceedingly tall chairs), and a huge bath tub (which is great for rinsing your feet, but is twice the size of the rest of the bathroom). the bed was comfortable, and the kitchen was very functional (no cutting board, though). there is no option for playing music (audio equipment, radio, auxiliary jacks etc. ), so be prepared to be without... wifi ok; owners accommodating and easy to work with. overall, a nice place to spend a night or two: after that, you'll be hankering for "that 70's show." hail caesar! Overall enjoyed our stay great views and clean. We had a great time the weather was perfect the views were phenomenal and we had most everything we needed privacy was definitely lacking with no curtains only sheers it would have been much better with heavier curtains as people did walk by our room when we were taking a bath. And it would be really nice to have comfortable dining room chairs and deck chairs other than that it was awesome. This is small and perfect for a romantic getaway. Nice kitchen seating for at least 4. Bed was king sized. The sunken jet tub was heavenly. Shower big enough for two💕�. The views out of every window were spectacular. Went to sleep to the sounds of the surf. We could have done with out the 60 mph winds and 15ft surf due to the very rare kona storm. Small complaint the couches were uncomfortable. Windows rattled and whistled during the storm but that was to be expected! This condo was just as described. Very quiet except for the wonderful sound of the wind and surf. The view cannot be beat. Because of the tropical setting the unit seemed a bit musty upon entering, but this was gone as soon as we opened the doors and windows. The authentic Hawaiian decor was nice. Be aware that if you arrive after dark you will need a flashlight to find your way to the A building. It is the furthest unit from the parking lot with a rather steep downward path. Once we found the unit we were delighted to be removed from the parking lot noise. There were a couple of things we brought to the attention of the owner and he was very gracious and quick to response. View outstanding. Very quiet except people above you can hear them walking across floor. Stayed 9 days and seems like condo is protected from the wind most of time. Enjoyed the hot tub especialy with the view. Was very clean, had a great time. Helicopter Tours, Shopping in Princeville & Hanalei, Historical Landmarks & Museums, Championship Golf Courses, or Nothing at All! There's more to do, see & experience than you'll ever have the time for! LAST MINUTE RATES AVAILABLE STARTING AT $155.00 / NIGHT Current 2018 Nightly Rates: $170.00 per night ( 3 night Minimum ) Planning on staying longer than 14 days - contact us for rate information Hawaii State Taxes @ 13.25% and a 1 time cleaning fee of $120.00.